Retchi Ubod, born without limbs, is an adopted layman of Adopt a Minister Internationl. Retchi visits people, especially those around his neighborhood, and tells them about Jesus. 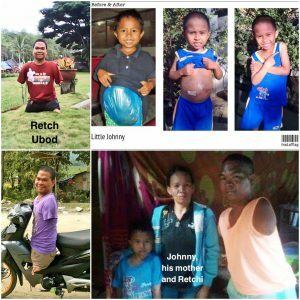 Not long ago, Retchi met Little Johnny (the 8-year-old who carried his intestines outside his belly for years) and who had his surgery at Davao Adventist Mission a year ago. Today, Retchi and Pastor Edwin Garzon, adopted Minister of Adopt. minister International, are giving Bible studies to Little Johnny and his parents. Praise the Lord for someone like Retchi who has given his life, though very difficult, to God’s work. To God be the glory!